Moving down the Gov 2.0 Continuum to Deep Change Agent. In the last 5 years or so “Gov 2.0” (Government 2.0) has grown from being a name coined by William Eggers to now becoming the umbrella term for serious change in Government, and not just here in the United States, but around the world. Many people, including myself have written much about the term Gov 2.0 – everything from “What is Gov 2.0” to lists of people leading current efforts. Lots of other angles have been covered by both the traditional media and online media. I focus primarily on people power and how people are at the heart of any Gov 2.0 discussion, whether in print or in person. In fact I have called Gov 2.0 a “good revolution” and as we have all seen in the last few years, this is true regardless of country. I do not mean to state that Gov 2.0 is causing revolutions. Far from it. However, the openness and transparency that Gov 2.0 efforts around the world advocate for; driven by mobility and the cloud – have allowed people to be heard. To hear each other, those people whether in government or civic life, in business or entertainment. Now thanks to the “Triangle of Gov 2.0” which is the social media and open computing use; the mobile and device specific tools; and the cloud which facilitates both; we now see individual people gaining access to information and power never seen before in our history in more than one country at a time. Now this is happening in multiple places. People are driving the change. People are adopting the tools. People are leading the way in forcing governments around the world to be more open and accountable. With this innovation of course comes the other side. The very same tools that can promote openness and transparency can and are in turn used against the people by governments, both democratic and not. But we are so past the “What is Gov 2.0” phase that I wrote about in 2010. We have blown past the “look the government is using twitter and facebook” phase. Indeed, we have entered the big data and deep analytical tool phase – complemented by more and more machine readable databases that are continually presenting new and innovative uses and creating new businesses and jobs. But people are still at the heart of the matter. Without courageous leaders willing to stand up to the buffeting forces of politics, budgets and fear; we would not be seeing the deep and dramatic changes we are witnessing unfolding in many countries, and many cities, and localities. People are driving this change, this is the constant in Gov 2.0 since 2007. This post by SierraCobb was first published at CTOvision.com. It Was Amazing. Thank you to all who made Gov 2.0 L.A. 2012 a success for the 3rd year in a row. We had over 44,000 people participate in our livestream of the event from at least 19 countries. A huge Thank You goes out to Callfire, Citysourced, Rockcreek Strategic Marketing, Davenport Institute, TechZulu, for sponsoring and making this event happen. All of the videos will soon be posted on to our Vimeo Page at http://www.vimeo.com/gov20la and additionally we will be posting the presentations shortly as well. Enjoy this Storify post about the various tweets, photos, blogs, etc coming out of this event. Rocking Citizen Power in 2012. In the 3 years since we have seen huge growth in social media, cloud computing, mobile technologies and the subsequent explosion of citizen involvement with our governments. This has caused all kinds of situations, good and bad. On the good we are seeing country after country begin to adopt open data and transparent aspects to their internal and external operations. We have seen citizens empowered to use their voice, many for the first time ever. We have witnessed several countries fall to “soft power” of people organizing, and then acting on the organization to effect change of a type we have never seen in our collective human history. On the bad, we are seeing totalitarian governments around the world cling to these new technologies and indeed even the people’s response to them; to crack down, imprison people, kill people and break up organized groups. I have written in the past about the two headed side of #gov20 and social media in general with regard to Governments and the people who interact with them. This dichotomy is growing, not abating. We see people using technologies to force change yet at same time we are witnessing governments around the world investigate the same technologies to prevent change. Gov20LA was created to act as a forum to collect the best and brightest people and their ideas and enable them to tell the world their stories. The idea has always been to empower people through learning about the cutting edge applications of technology in government and by the companies servicing them. We feel that by letting you see the speakers in a casual, yet live setting online – we all can learn from the human conversation and dialogue. Technology is great, solves lots of problems and saves money when properly applied. The problem with most technology conferences and events is they are too jargon laden and usually do not encourage open dialogue with the speakers. We do the opposite. We want the dialogue. We want our speakers interacting both with the live audience in the room and the global Internet TV audience. So we have created an open environment, with some truly amazing people from inside and outside government leading the dialogue. I am personally so humbled and excited by the continued awesome response Gov20LA receives worldwide. I can’t wait for this year. Join me. Thank you. 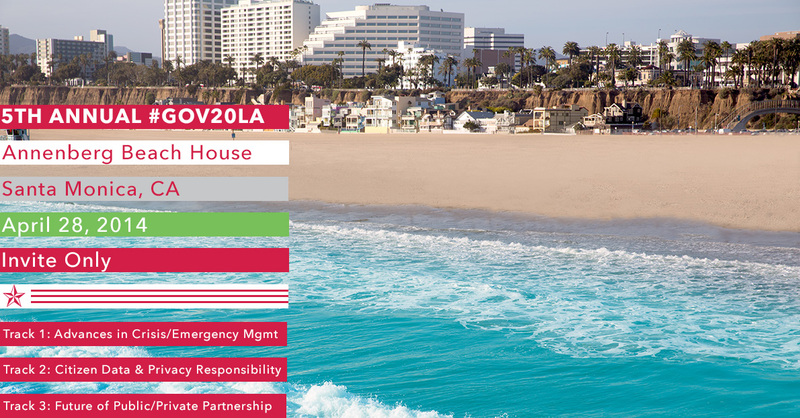 We are pleased to announce that we are now accepting both sponsorships and ticket sales for Gov 2.0 L.A 2012, April 21, 2012. The complete list of confirmed speakers will be announced within a few weeks. We have three levels of sponsorship, platinum, gold and silver. Individual tickets are priced at $75.00 which includes lunch and ensures an accurate head count. All sponsorship levels include some tickets and marketing and branding opportunities that vary per sponsorship levels. As in the past years, this event is user generated, both in terms of sponsorships and content. We rely on your sponsorships and ticket purchases to provide continuous live stream, HD videos and interaction from the internet before and during the event on a global scale. Gov 2.0 LA would not exist without your continued help and support. Thank you, and use the link below to choose how many tickets or what level of sponsorship you want, and the checkout process is quite easily done. THANK YOU AND SEE YOU IN APRIL!